We are 68 days down and only 2932 days to go on our 3000 day journey to financial independence. If I have ever seen a market due for a correction, here it is. Remember the old chestnut saying….”the bigger they are, the harder they fall”…very relevant here. The low point for the S&P500 in 2009 was 683 points, as at 6th March 2018 the index is at 2728 points. When (not if) we have another financial crisis, and we fall to these 10 year lows, that is a 75% downturn….could you stomach that? If your investments went down by 75%, you now need the market to recover almost 400% just to get back to even. That is more risk than we care to take. The world is on a debt binge….excessive housing debt and risky lending practices was one of the main causes of the GFC in 2008/09 and what have we done since then? Repair the damage by lowering our debt? NO. Improve our lending standards? NO. Make financial institutions more accountable? NO. Nothing has happened, in fact governments and central banks have inflated the debt bubble even further, to astronomical heights. As a comparison, the world had debt of US$142 Trillion in 2008 before the GFC….as at January 2018 the world had US$233 Trillion, an increase of 64%. If that is not enough to scare you, then we have a US student loan crisis, US auto loan crisis, liar loans, loans to insolvent companies and loans for companies so they can buy back their own stock and inflate their stock price!! The one thing that will certainly pop the debt bubble is rising interest rates. You will unfortunately see a lot of overleveraged individuals, businesses and governments falter under rising interest rates. As bond yields and bank deposit rates rise, you will see an exodus from stocks into “safer” interest bearing investment vehicles. There are 2 historical peaks (red line) just before stock market corrections…the first was the dot com bust in 2000/2001 and the second was the GFC in 2008/2009. 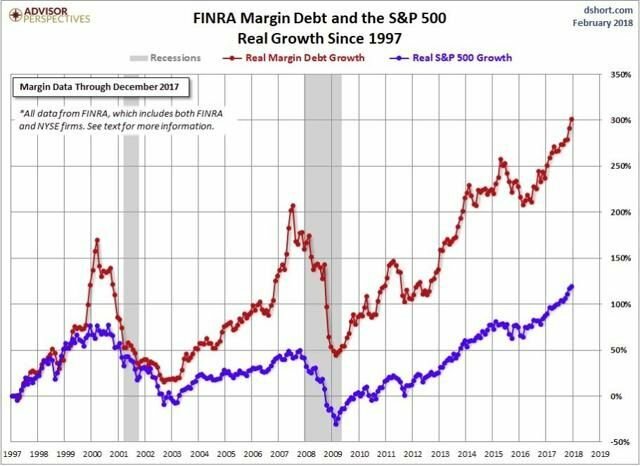 Look where margin debts are now…at all-time highs. This means investors are way overleveraged. Any sniff of a market correction and these positions will begin to unravel and it will bring down the market. Remember…”the bigger they are, the harder they fall”. Cash: No, by this I don’t mean under the mattress. Our funds are investment in online institutions such as ME Bank and Ubank. These providers have some decent interest rates of around 3%. We hold cash to take advantage of any stock market downturn. Betashares BBUS: Based on all my reasons above, this is by far the best investment we could possible hold in our opinion. For those that don’t know, this is a fund that basically “shorts” the US stock market. We are invested to expect a US stock market downturn. In 2 months we are up 6% and we believe that once the US stock market does turn down properly, we will have some serious gains to add to this. Real Estate: Typically real estate prices stall or fall with the stock market due to the wealth effect and bank tightening lending standards. We hope to pick up some bargains as a rental investment. We agree with the typical financial independence investment approach of low cost index investing in general, however in our opinion the timing is not right to be passive. In our view, we are on the cusp of a massive financial shock brought about by excessive government spending, excessive private and public debt and unprecedented central bank intervention. Again, ask yourself…could you sit back and watch your investments and net worth fall by 50% - 80%?